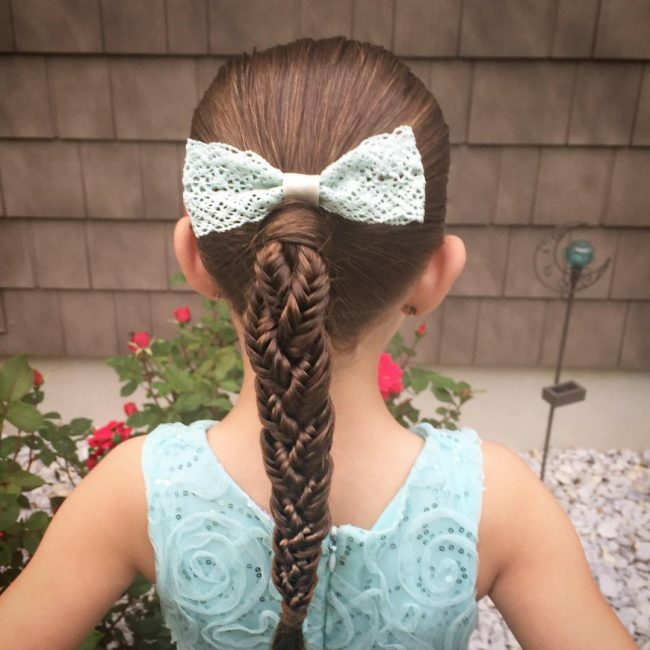 As a parent, you just need to know some little girl hairstyles. Unlike boys, girls are very concerned with how they look especially in front of their friends. 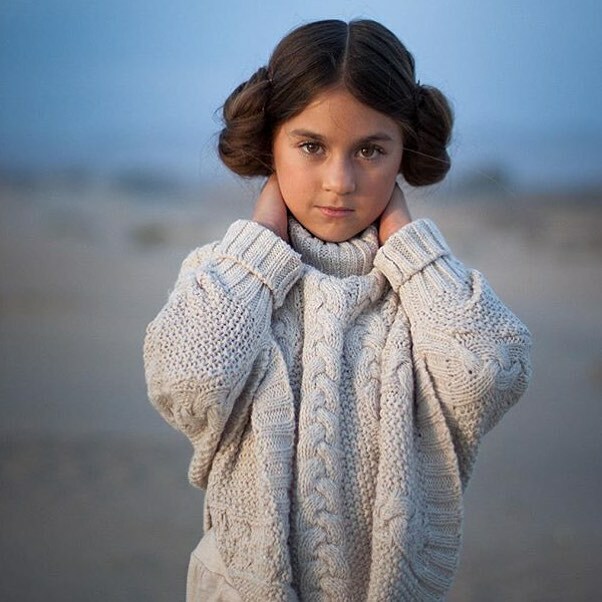 And so you should always aim to give your princess a hairdo that will make her stand out and feel confident in front of her peers. However, this should not be a problem because you only need to find out what she likes and also consider her type of hair and length. 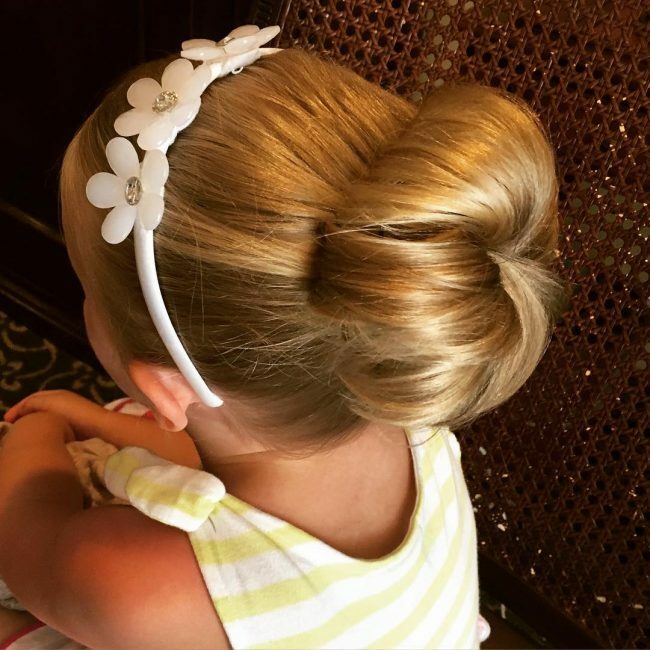 Hairdos for your little angel can range from playful braids to some neat and fancy buns or even some loose natural looking styles. If you are looking for something elegant to try on your little one here are 50 stylish styles to give you some inspiration. 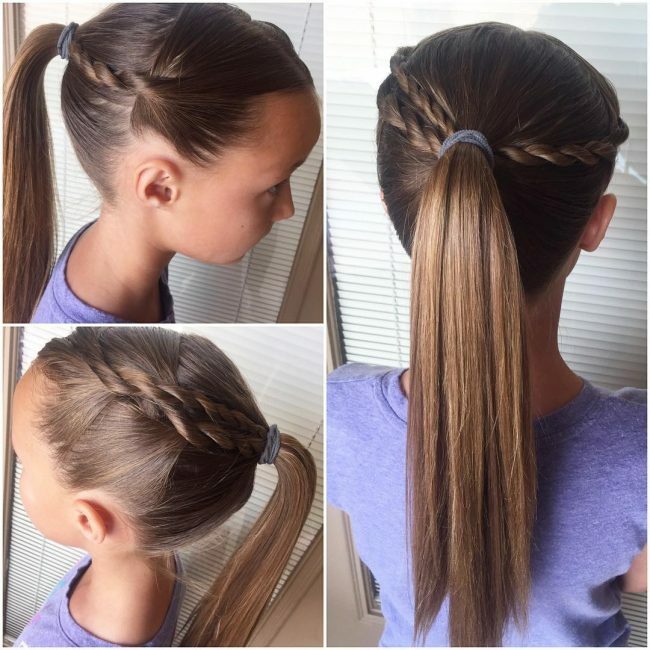 This hairdo is one of the easiest that you can give your little girl provided she has long hair, and you also have basic braiding skills. It entails weaving two braids from the front and then joining them at the back to create chunky twists. You should then finish the chunky twist by tying with a band to create a fishtail. 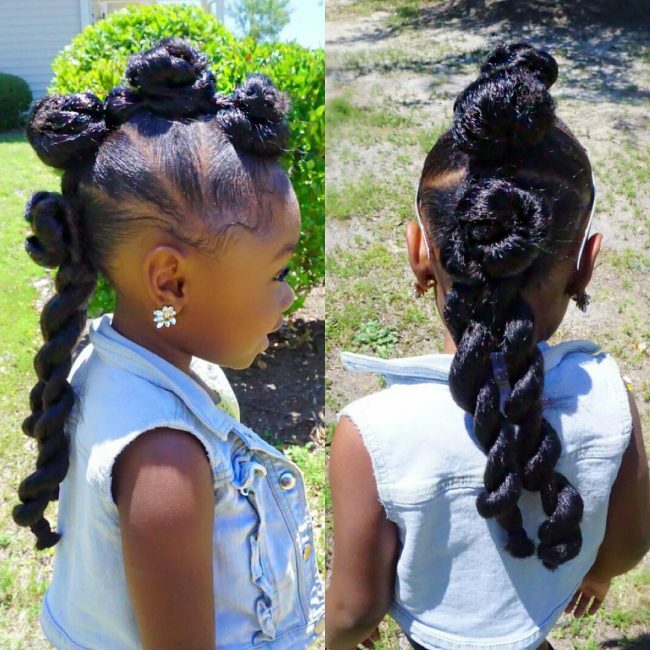 Little girls have a healthy natural hair, and if you let it grow out, then you will not have to do much to give them a charming headdress. In this particular style, all that you need to create a refined look is to form one pull through braid at the front. You should start it at the center and weave it towards one side. 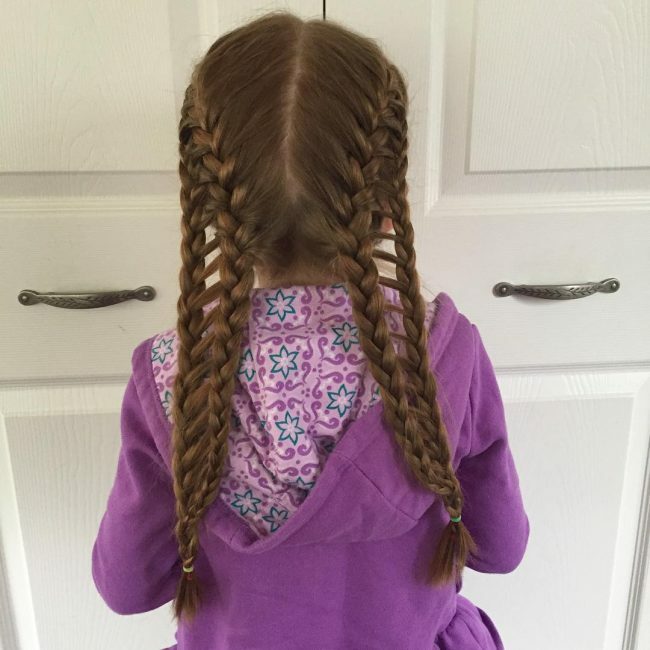 The crisscrossing pattern that these double wrap French braids create is amazing, and it will make your princess look fabulous. Although they may look complicated, you can create them easily if you know how to braid hair but you will need to get a little bit inventive. 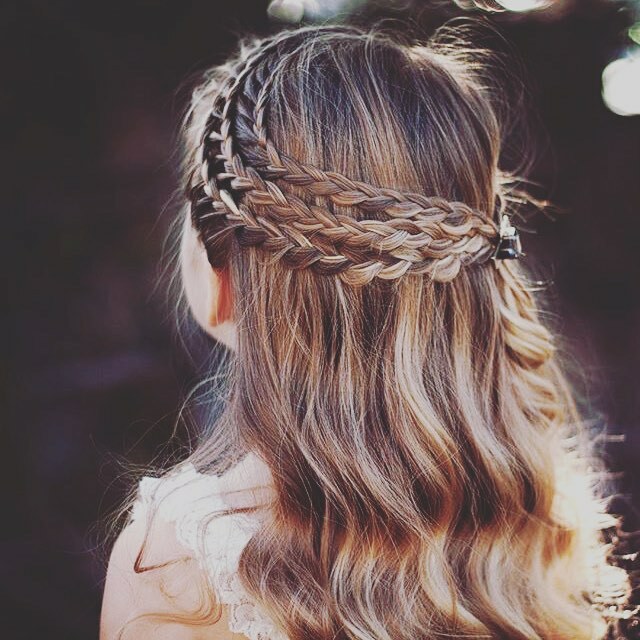 This style will look best if your child has a long mane. Although this hairstyle will require some skill to create you will get better at it through practice and so you should try it until you make it perfectly. Here you should section the hair into two using a center part and then weave each section into an intricately feathered pigtail. 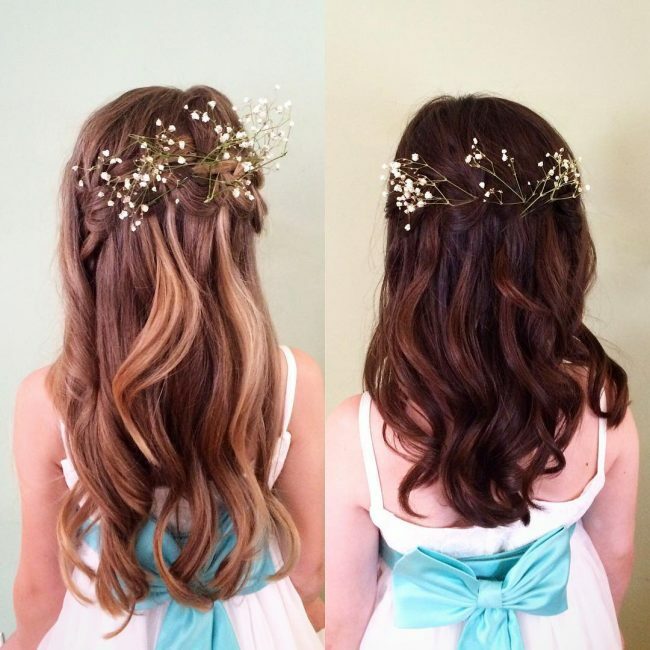 And just like with most other hairstyles for little girls the longer the hair, the more adorable it will look. because you will give her a unique look in the process. These curls are a perfect example of this and to create them you only need to use a curling wand to make the strands curly on the ends. You should then finish the look with a side part and by sweeping the beautiful curly locks to the back. Some girls do not like a free flowing mane, and if yours is one of them, then you should give her this fabulous updo. 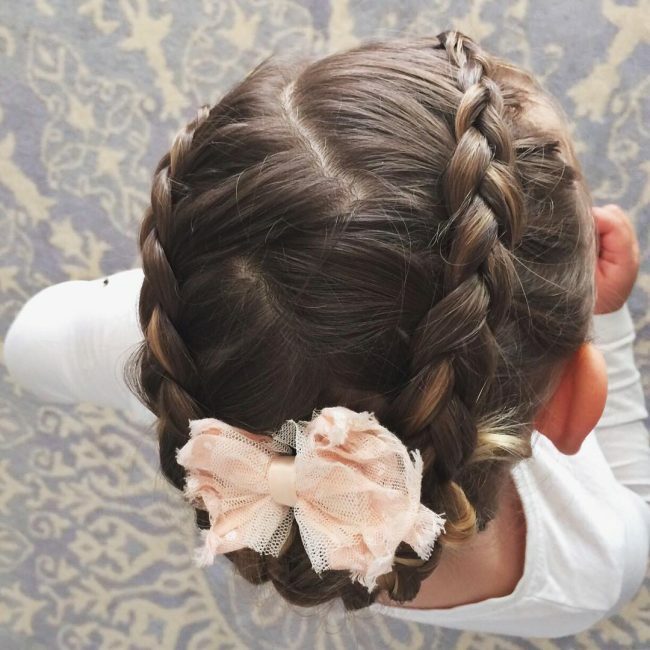 This headdress involves forming two French braids starting from the front and meeting at the back to create a small braided bun that you should accessorize with a simple pink bow. Here is another classic updo that a little girl can wear for a school dance or any other formal event. It entails pulling the hair to the center of the head where you should make it curly and weave it into a beautiful bun. This magnificent headdress will help your little girl tame her mane, and so she will be able to play all her favorite games without it coming over her eyes. It also looks very exquisite and to create it you should pull the strands to the center and tuck them into a medium size bun. And to make your girl look trendy, you should spice up the knot with a beautiful clip or hairband. 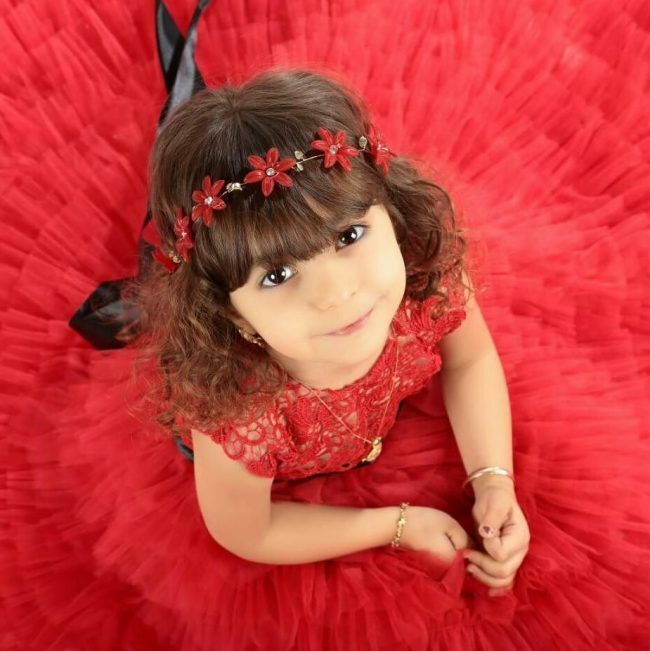 If your little angle has a naturally curly hair, then this is one of the best hairdos that you can give her. 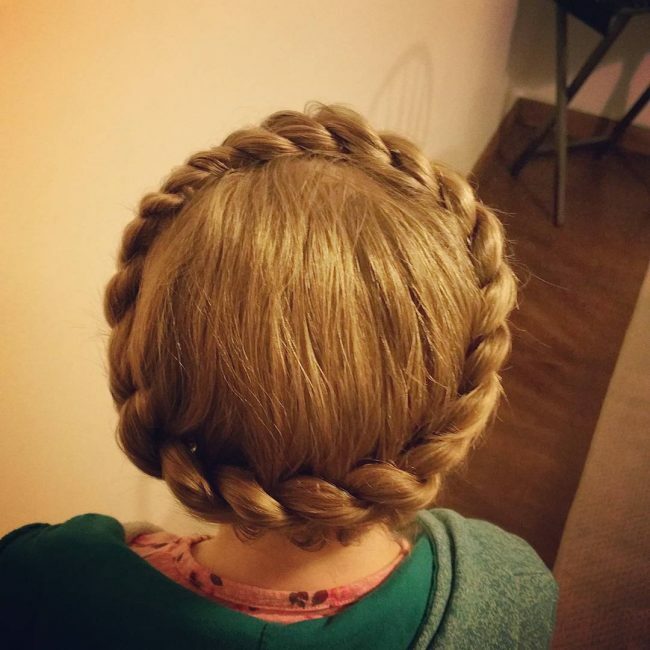 It is also very easy to create because you only need to braid a few strands on the crown to create a half Dutch braid. 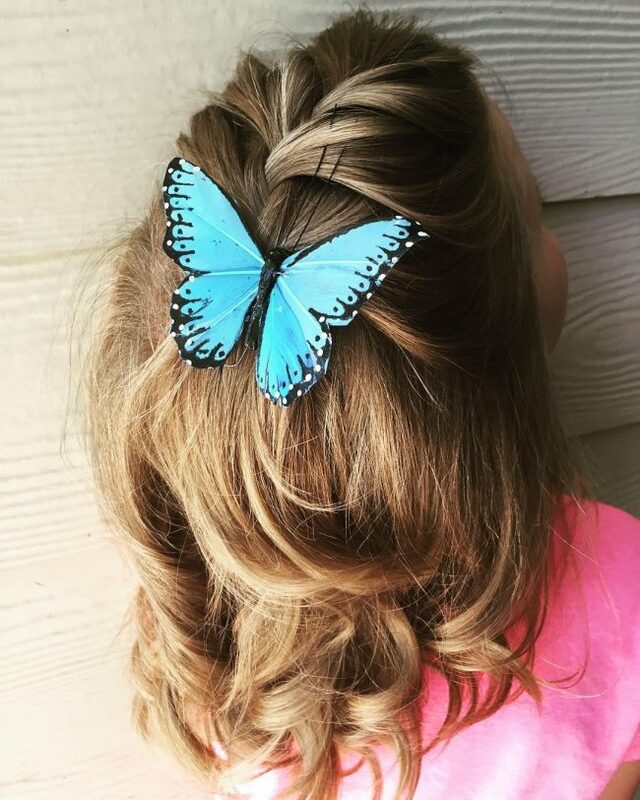 You should leave the rest of the hair to flow to the back and spice it up with a beautiful butterfly clip. 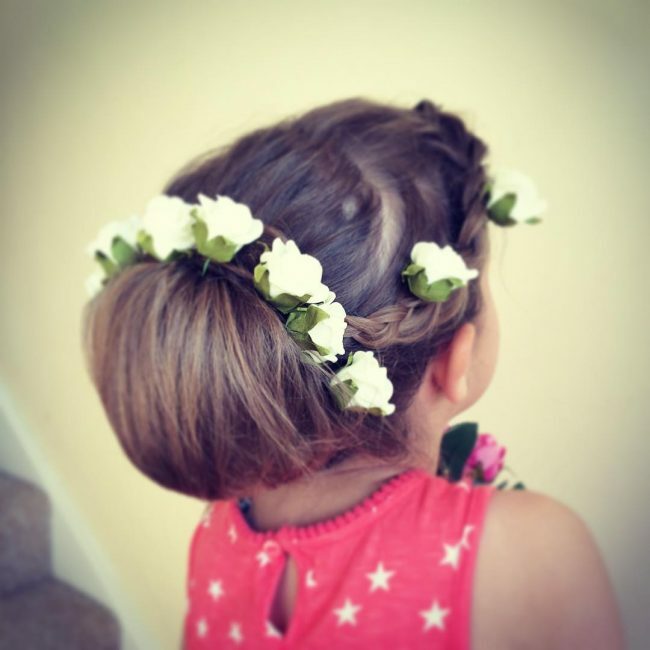 Sometimes all that you need is a simple trim to add some texture to your child’s hair and the right accessory. In this style, for example, the long strands have a moderate trim and simple push back styling. However, they also have a lovely stretchy headband that helps to make them look fantastic. Breaking away from the traditional looks will almost guarantee you of a top notch and unique look. This style may have a typical ponytail, but it looks very distinct due to its inventive styling that entails pulling everything to one side. 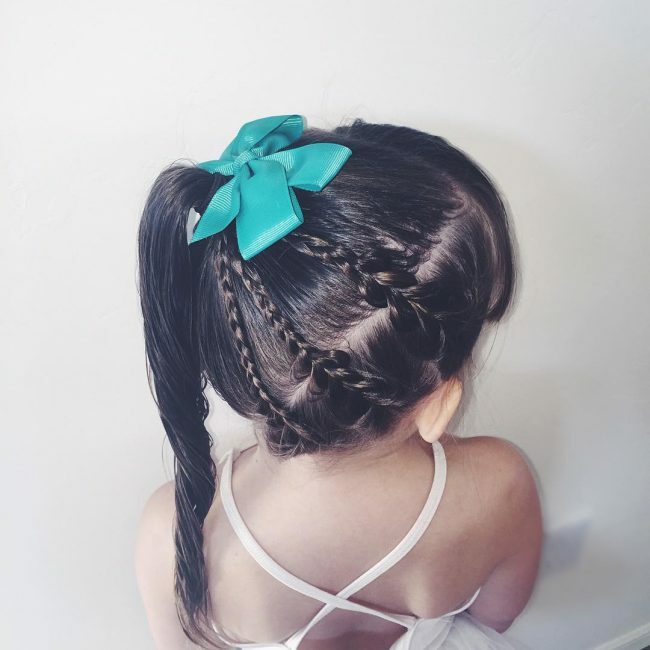 You should then tie the strands into a ponytail and then weave the ones protruding from the pony to create an elegant headdress for your little one. This design is another take of the side ponytail, but it does not involve any braiding. Instead, the hairdo has some fancy elastic knots that create a fantastic pattern on the head. You should then bring everything to the sides and tie the strands to create a beautiful side ponytail. 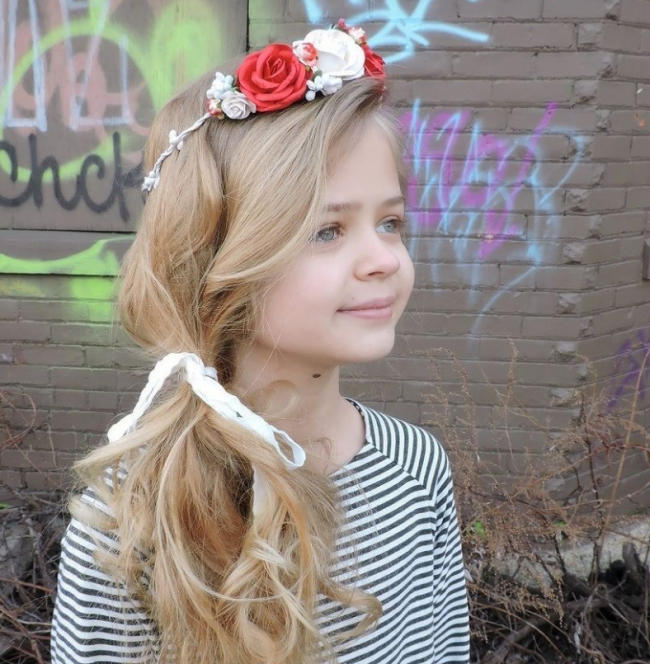 To make this hairstyle look exquisite, you should use multiple colored and bright elastics bands. 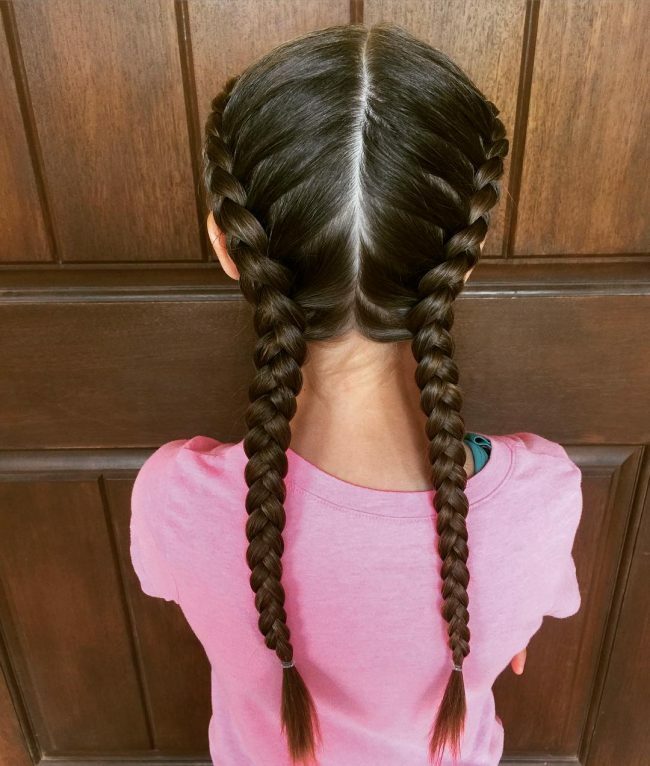 Braids are one of the most preferred hairdos for little girls, and this is simply because they always look good on them. The ones in this style are in a Dutch style and to create them you should section your strands into two using a center part. You should then weave each section into a Dutch twist and finish it with a fishtail. 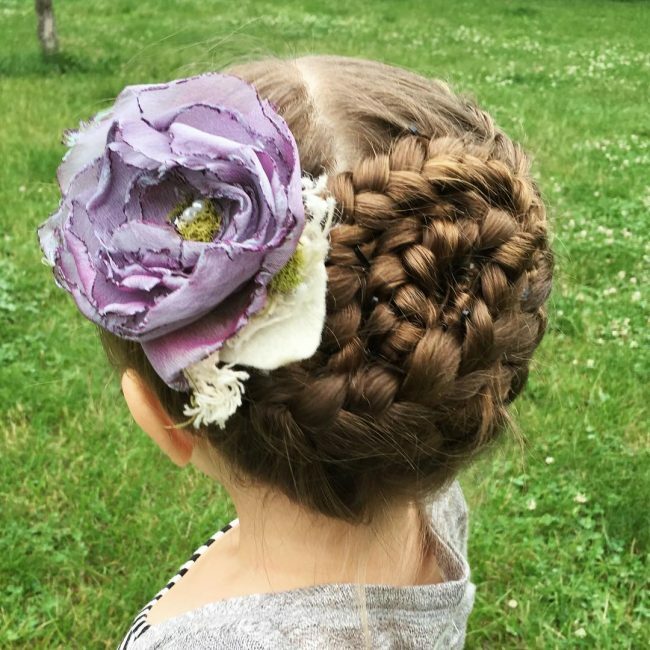 This crown braid design is unique because it does not just wrap around the head. Instead, the braid finishes at the back where you should pull it to one side and create a side ponytail. This design then finishes by accessorizing with a beautiful flower clip. 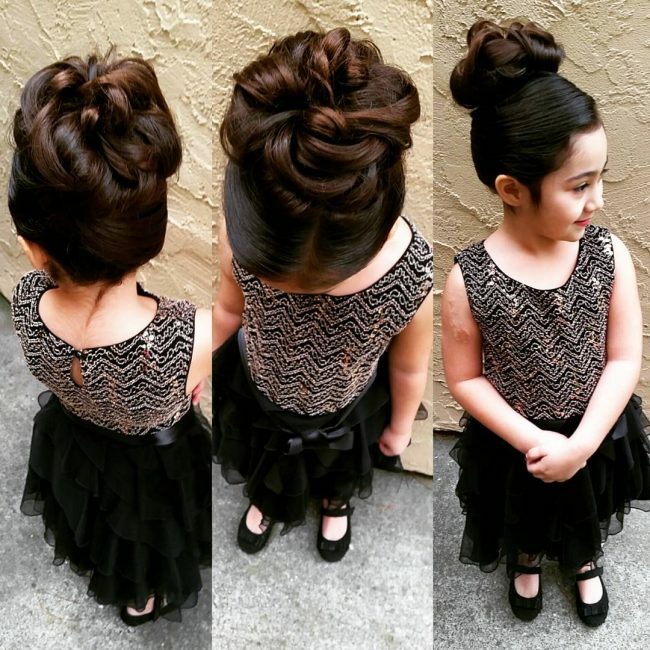 A style like this one will make your little angel the center of attraction everywhere she goes because it is not just unique but it also looks very elegant. The style entails weaving some fancy twists in the middle of the head to create an artistic Mohawk design. However, the length of the strands and their healthy glow also help to spice up the overall appearance. This fancy hairstyle consists of three fan buns that come from tying the hair with elastic bands. Although this style can work with any length, the knots will look best with medium or short hair because they will be easy to create and style. You should also use some brightly colored bands as this will help to enhance the overall appearance. Whether your baby has a big day at school or it is a special day for her such as a birthday party, then this style will be perfect. It involves creating some spiral or wrap around French twists that start at the front and wraps around the head before finishing at the center. You should then spice it up with some beautiful white roses. If your girl already has a beautiful long hair, then you have to do little to take her appearance a notch higher. A simple bow like the one on this design is perfect as it will make her look very elegant and the good thing about it is that it is very easy to create. To form the bow you will only need to twist and pin the strands while leaving two chunky locks flowing from the bow. 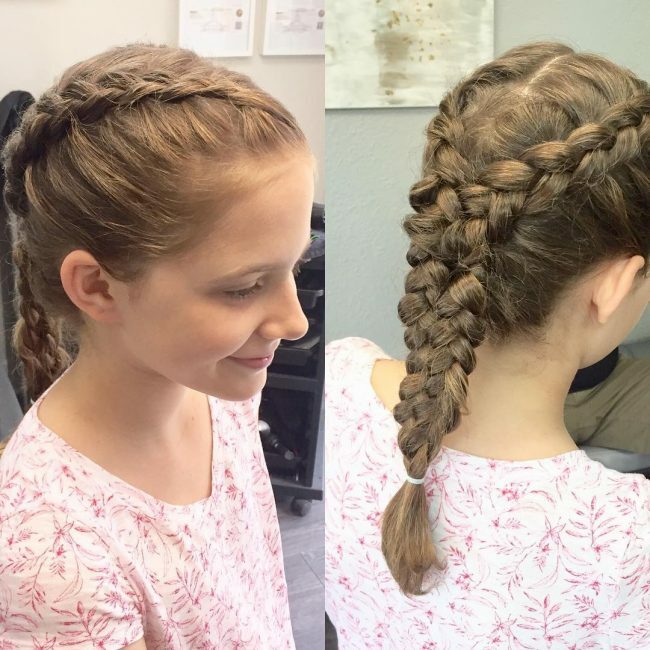 To create this fantastic look you will only need to have basic braiding skills or simply know how to make a Dutch braid. You should divide the strands into two parts with a center part and then weave each one of them into a neat Dutch braid and finish it by tying the ends with an elastic band to create some lovely pigtails. 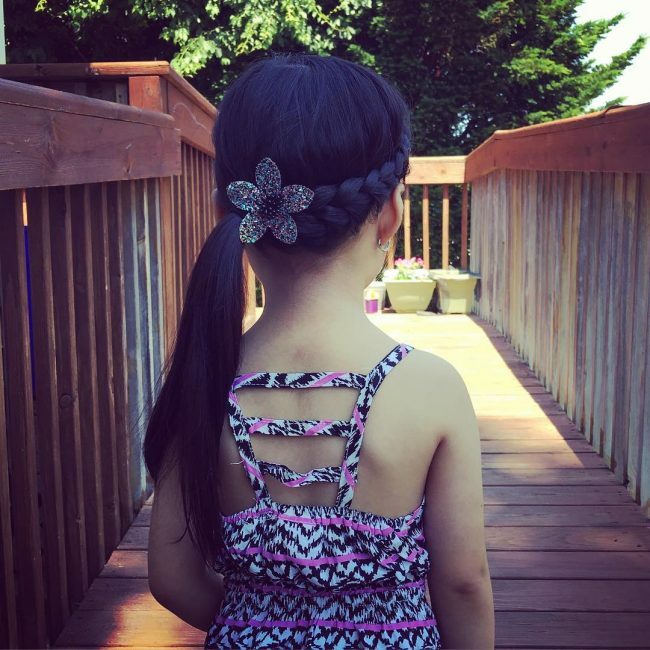 Mini braids are perfect for moms who are learning how to weave and also for girls who have shorter hair. They are very easy to create, and if you want to replicate the ones on this headdress, you only need to have two on the crown flowing to the side from a center part line. You should leave the rest of the hairs flowing freely and spice up your mini twists with a beautiful ribbon. 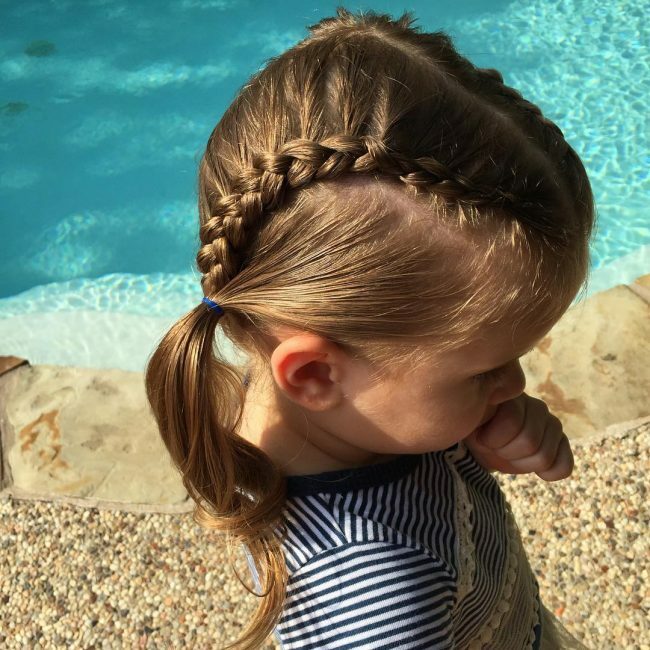 Pull through braids make fantastic little girl hairstyles, and they are also not hard to form. If you want a fancy one like this, you should brush back your girls' strands and tie them into a pony. The last step is to weave a massive four strands pull through braid using the hairs that flow from the ponytail. The beauty of this headdress is all in the haircut and the volume of the hair because there is no much styling involved in creating it. To give your child this look, you should chop her voluminous strands to create some beautiful bangs and a fringe at the front. The only other thing that you will need for the style is a beautiful headband full of flowers as it will help to spice up the style. Chignons are not a preserve for adults because they can still work for girls if you make them inventively like in this style. Here you should brush back her long and smooth strands and then pull them to one side. To finish the look you only need to wrap and pin your strands to create a straightforward and beautiful side chignon. And if you accessorize with some lovely kiss clips you can be sure of a look that will make your little princess stand out. Blonde hair is cute, and it will make your princess look magnificent, and if it is also long, then you can enhance it appearance with a simple four strand rope twist. To create it you will need to section the hair into two and then weave each part into a beautiful four strand rope twist. 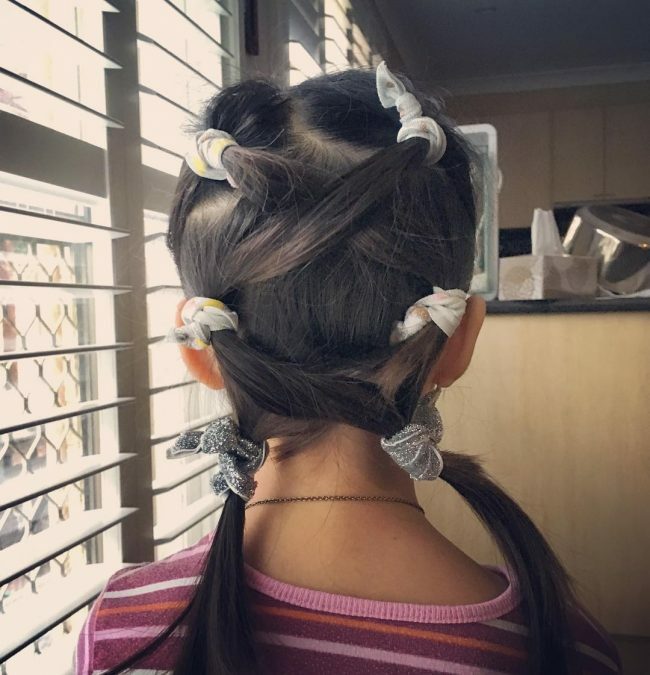 And to spice up the twists further, or take its appearance a notch higher, you should tie their ends with an elastic band to form some adorable pigtails. 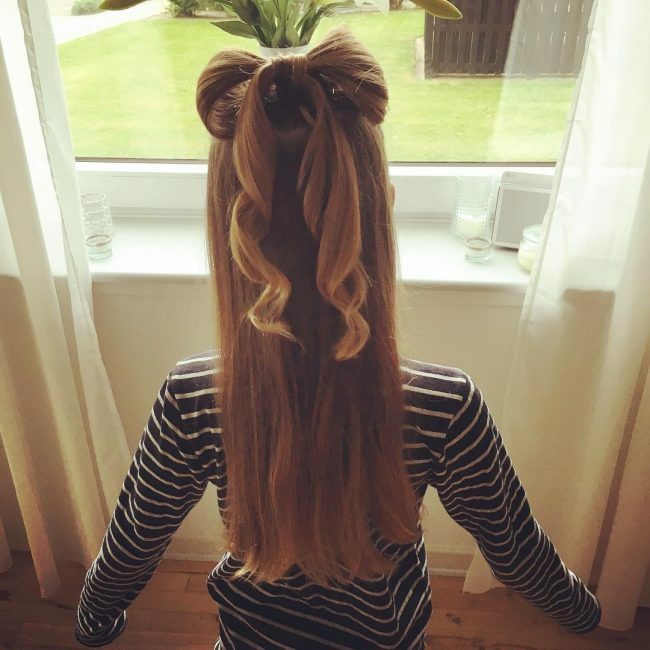 You cannot give your little princess an outstanding hairdo if you do not get creative. 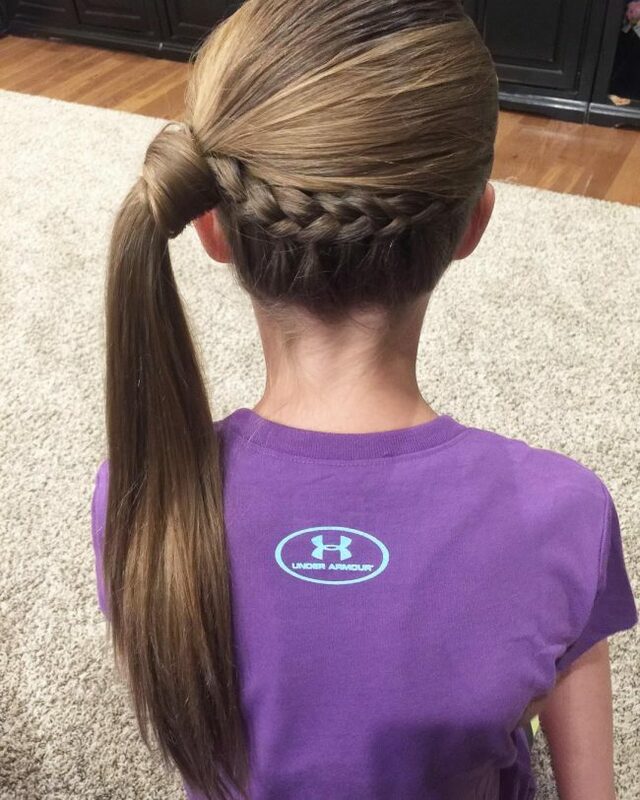 Rather than just go with the typical everyday styles you should get a little innovative and give her a distinct style like this one by combining a chic lace braid with a neat and tight ponytail. To create this fabulous hair, you should start by forming a simple lace braid at the back that starts from one side and ends on the other. And to finish the refined look you should pull all the strands and join them at the end of your lace twist to create a neat and tight side ponytail. 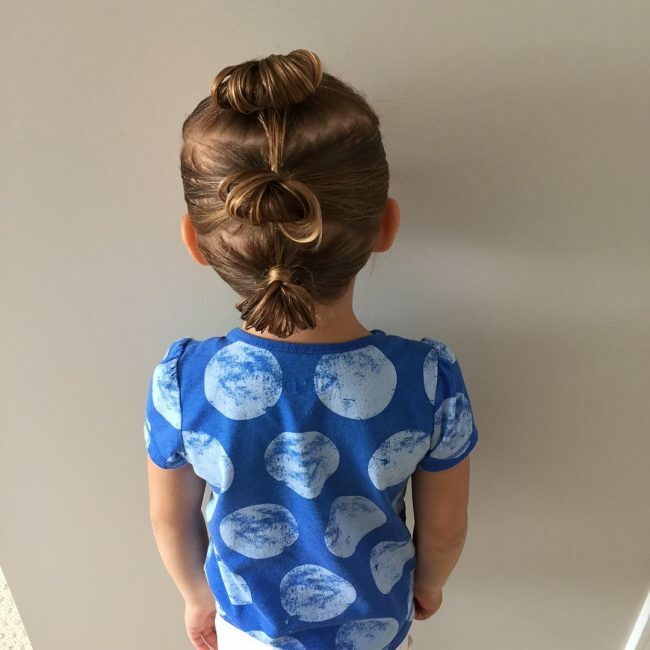 Top knots make life easy for both moms and little girls because they are easy to form, and your little one does not have to sit down for many hours as you work on her hair. This one is as straightforward as it can get as you only need to pull her locks to the center of the head and twist them into a knot and then finish by accessorizing with a fancy headband. Girls with voluminous hairs like this one make life easy for their moms because styling them is very easy. Simple side braids that end at the back and into the massive tucked bun are enough to give your princess an adorable look. And if you spice up the design with some flowers then your girl will turn heads everywhere she goes. To create this look, you should divide the long strands into four quarters and use small cloth bands to create some crisscrossing ties. You can have the knots in various colors or just use what you have because they will still look stunning. However, this hairdo will only work if your child has a long mane. 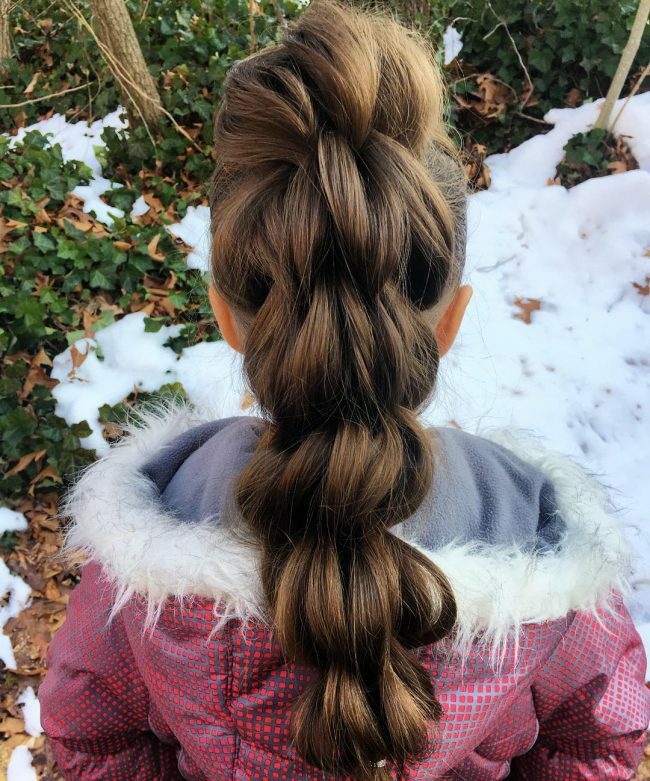 Braiding is more than just weaving the strands neatly and so if you want your princess to stand out you should also give her a unique style like this one. 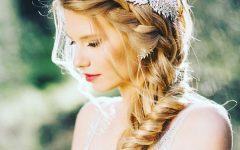 The style has some four strand braids that start at the front and flow neatly to the back where you should finish them with a fishtail or a regular braid. These strands are also very long, and they have a beautiful natural color, and this also helps to enhance the look. 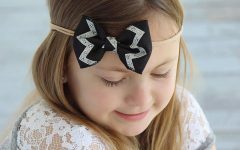 The vintage lace bow in this design is the first thing that will catch most people’s attention because it is unique. However, with such an adorable accessory, your cute girl still needs a stylish hairdo if you want her to stand out. And the design on this headdress is a perfect example of this, and it entails tying the strands into a ponytail and then weaving it into some intricate fishtail braids. This hairdo takes the traditional French braids a notch higher, and it does this by using three medium size twists instead of one. The three braids do not also incorporate all the strands because some long wavy locks still flow to the back below them and to finish the look you should introduce a fancy clip on the side. 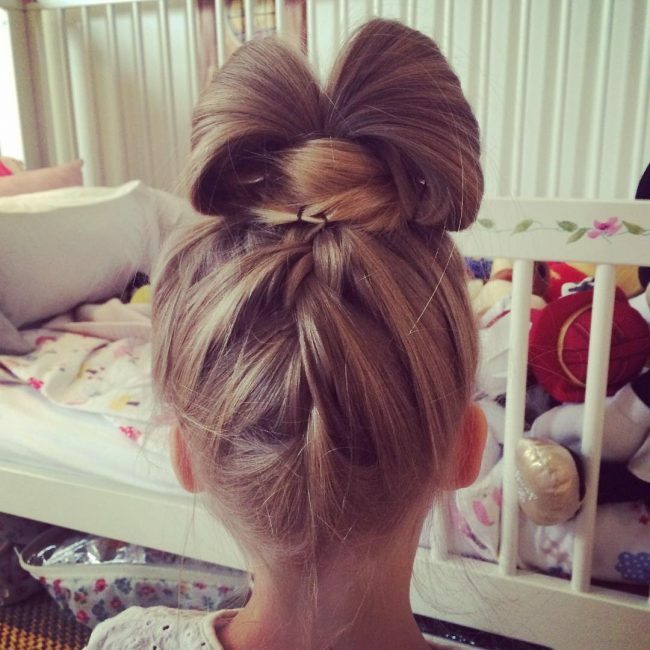 Although buns make fabulous hairdos they can be quite ordinary and so if you want to spice up your child's side bun you should make it look unique. One way to do this is by introducing a center part to section the hair into two. You should then pull each section to the back and roll it into a neat bun. 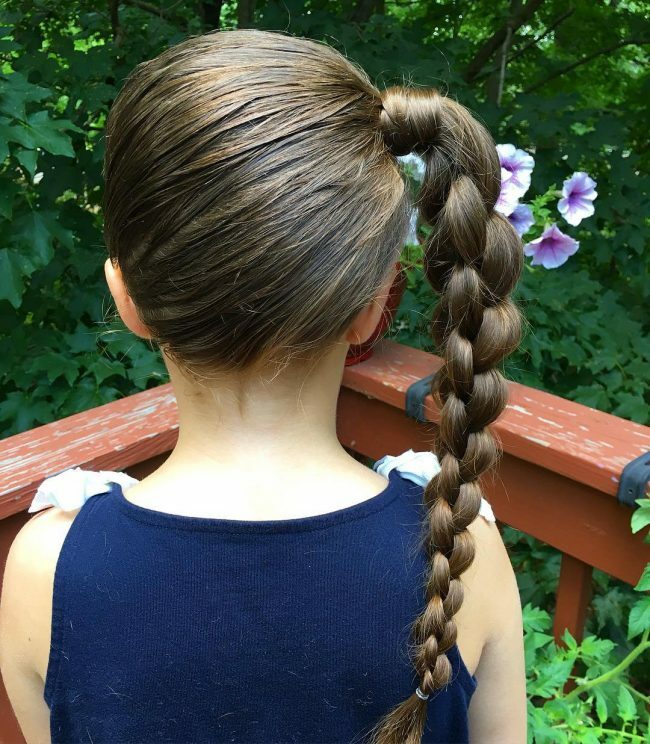 Anyone can create a rope twist, and you do not even have to be good at braiding, and this is what makes them a good idea for your little girl’s hair. These have a very excellent look because the design has two ropes with one starting at the front and the other at the center of the head. The two twists end on the side to form one that flows over the ear, and you should accentuate it with some beautiful pink ribbons. 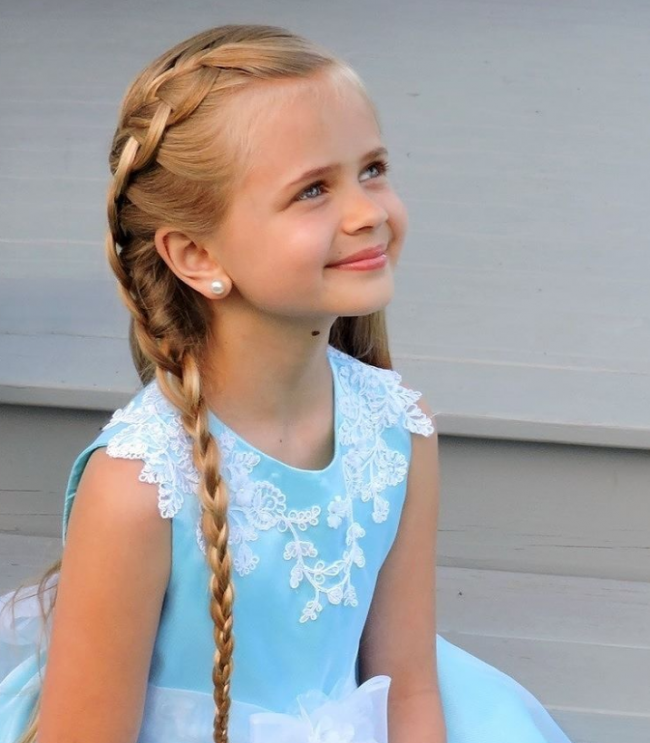 Yes, your princess is old enough to wear pearls because they do not have an age limit. And so if you are thinking of giving her a hairdo that will make her look elegant and also classy then you can try this one. 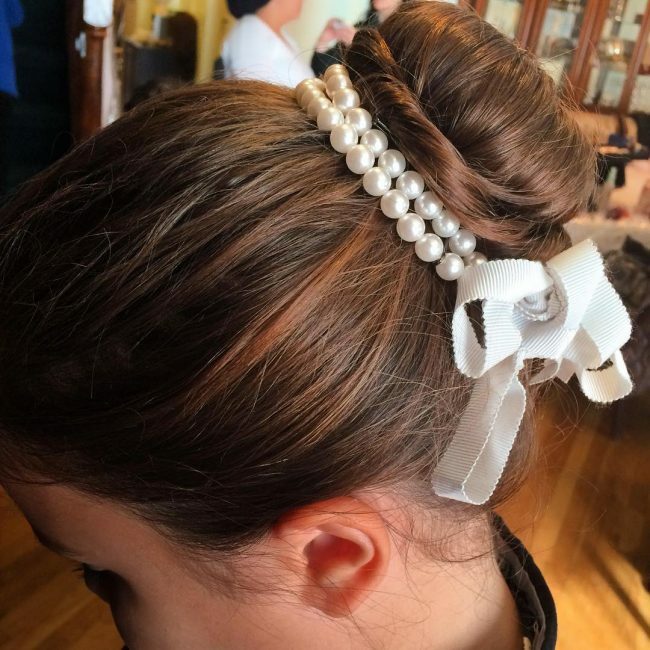 It entails pulling the strands to the center of the head and tucking them to create a neat and tight bun that you should then enhance by wrapping some beautiful pearls around it. The elegance of this headdress is on the haircut, and it entails chopping the long strands to create an arched fringe and some wavy bangs flowing to the side and back. 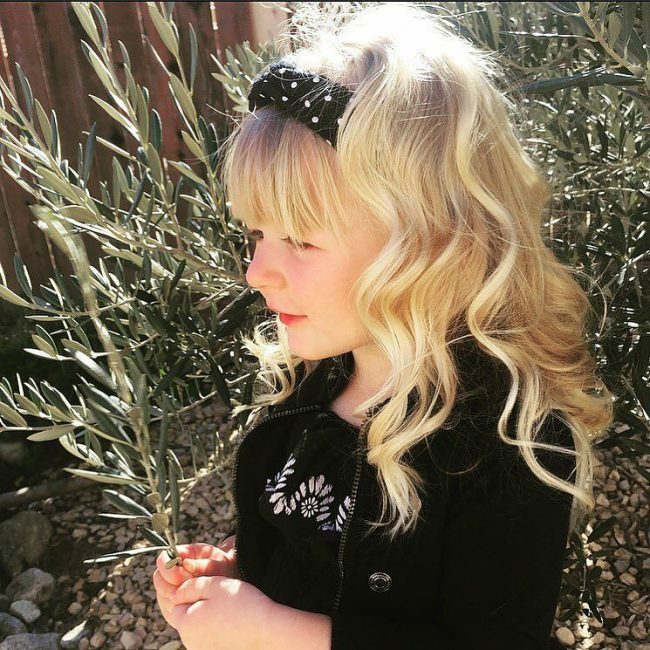 These strands also have a beautiful blonde shade that will brighten your child’s face, and you can create some contrast by adding a black headband to the style. A headdress like this one will make your baby look very charming, and the best thing about it is that she will not have to sit and wait for a long time as you make it. To create this style you should make her hair curly and pull it to the center of the head to create a lovely swirly bun. And to finish the design you will only need to accessorize with a beautiful flower crown. 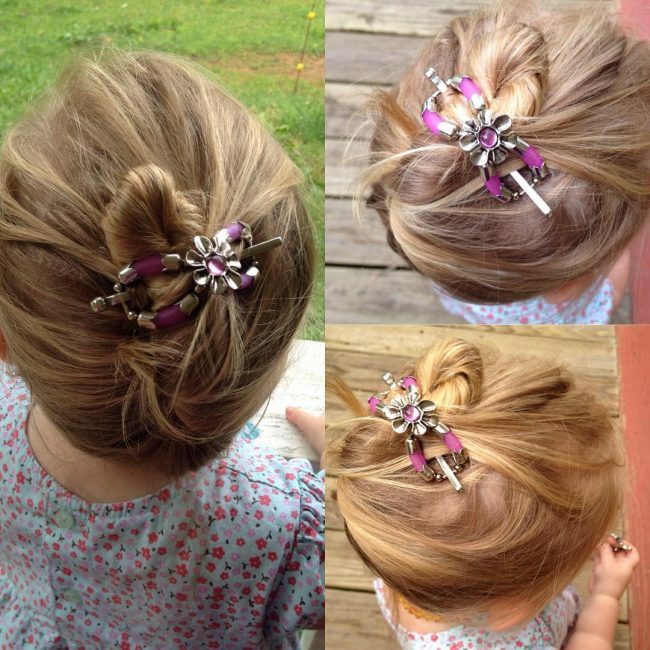 If you have a beautiful Flexi clip like this one, then you do not need any sophisticated styling because it is enough to give your daughter an adorable look. All that you need is to twist her hair tightly and neatly and then use the beautiful clip to give her a simple but gorgeous knot. 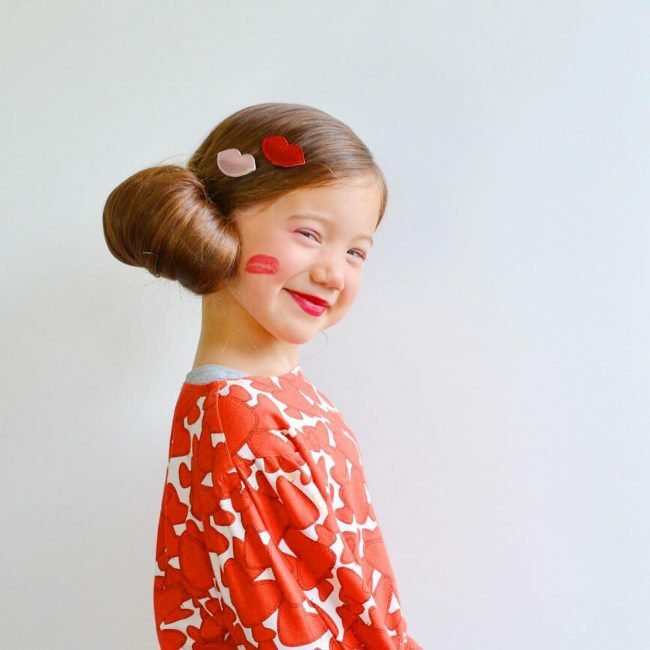 This magnificent hairdo is another example of the fantastic look that a little creativity can give your little girl. 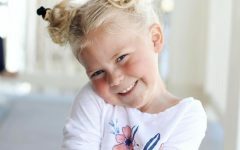 Although it may look overwhelming and a little bit challenging to make this is one of the easiest hairstyles that you can give your daughter. However, you still need to have basic braiding skills and also know how to make a bow. 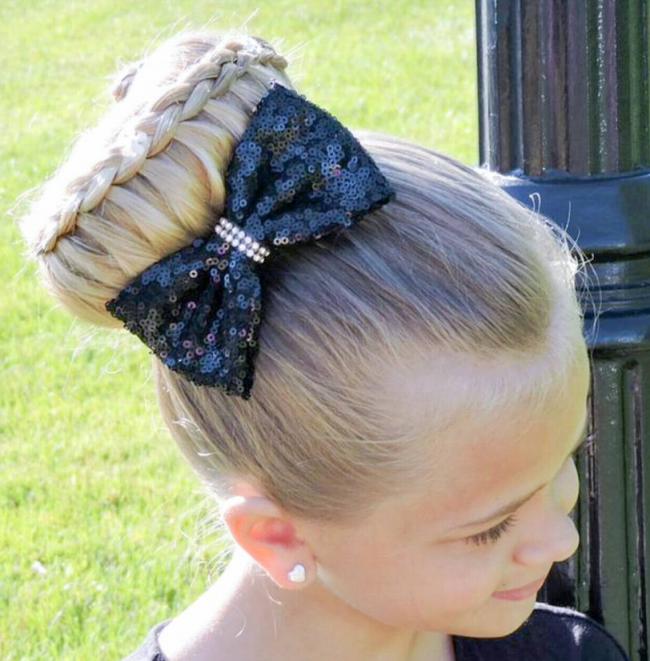 To create this style you should form a medium backward twist starting at the back and finishing it at the center of the head where you should have an enormous and beautiful bow. One of the things that make braids special is that there are almost unlimited ways of creating them. 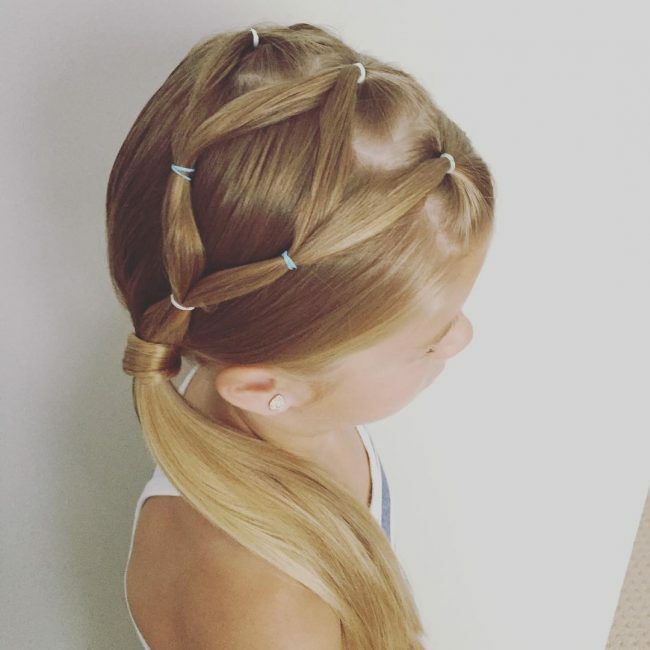 A waterfall like this is one, is unique and so if you want to give your child a style that will make her look distinct, then they are a good idea. Waterfalls are also perfect for controlling the flow of her mane to ensure that the strands do not come over her face. 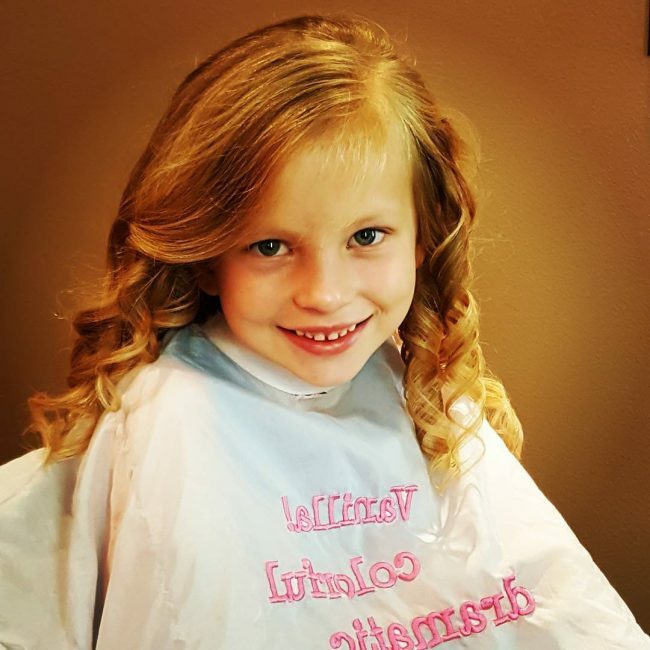 And if she also has some soft curls then you can be sure that she will look very adorable. 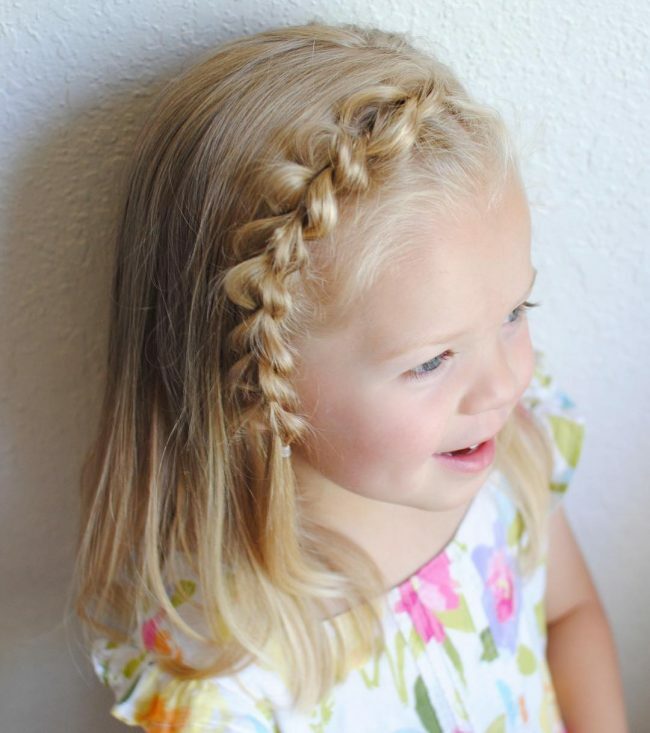 To give your daughter this eye-catching headdress you should first comb her strands to make them neat and smooth. After this, the next step is to weave a few rope twists starting on the sides and finish them at the center of the head where you should pull everything together to form a smooth and fancy looking ponytail. If your girl is patient enough to sit down for some time, then you can give her this exquisite headdress that entails weaving her strands to create a perfect rose braid and accessorizing it with a flower. You should also have one French braid hanging at the back to spice up the overall appearance. The golden blonde shade of these long locks is amazing, and it gives them a very vibrant tone. 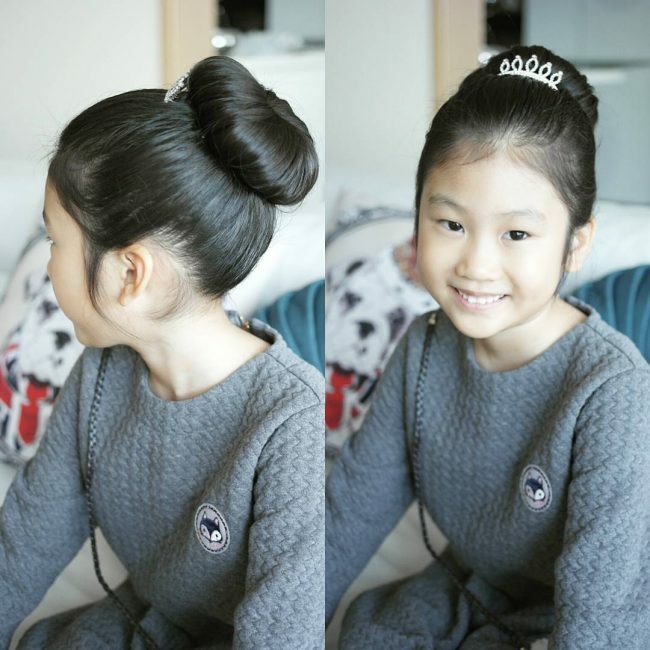 These strands also have a lovely styling that entails pulling them to the center of the head and tucking them neatly to create a beautiful bun. And to finish the look you only need to accessorize with a lovely headband. Several things make this a top notch hairdo, and so if your girl has a lovely dark-toned hair, then this is one of the best looks that you can give her. It entails chopping her strands slightly to create a fancy fringe at the front and then pulling the rest of the strands to the center of the head to form a ponytail. You should also create a few pull through braids that start on the sides and end in the pony. Crown braids are very elegant, and they create a stylish updo that will make your princess look very exquisite. 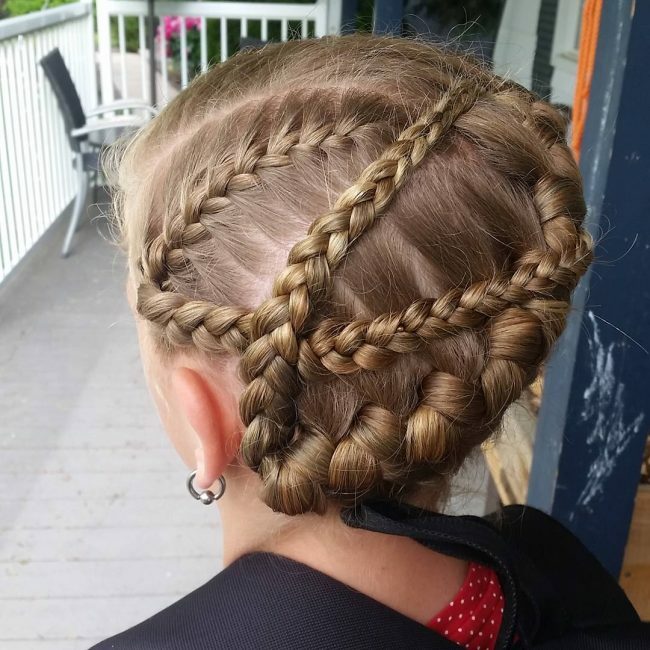 However, the one on this style is quite different from the others because it does not use the typical French braid but it instead has a neat medium size rope twist that makes the design look splendid. 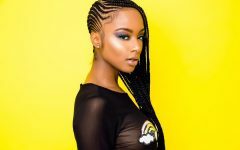 This hairdo will require you to have some advanced braiding skills to create it, but there is always the option of using a professional stylist in case you are not very skilled in weaving hair. 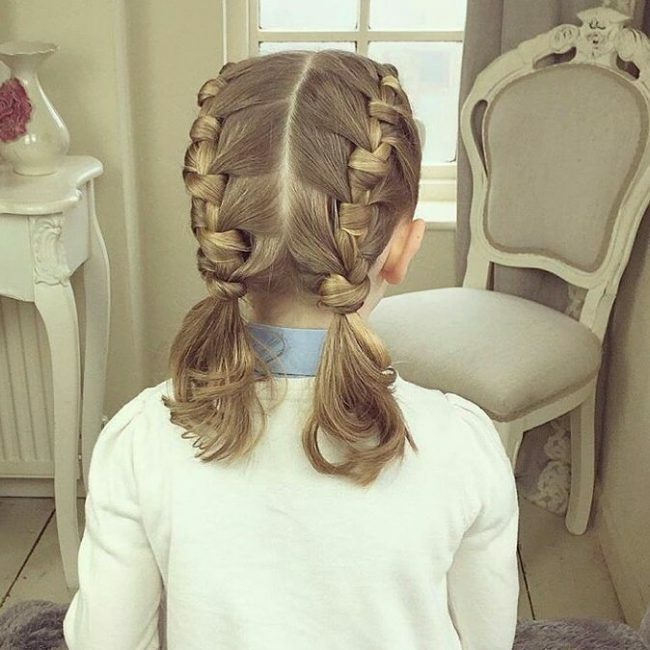 The design entails dividing the strands into two parts and then weaving each into a fancy French ladder twist that you should finish with a pigtail. If you can give your girl such beautiful hair, then you can be sure that she will be happy all day at school. This headdress is not just neat but also very girlish, and so you can be sure that she will love it. To create it you should create two stunning Dutch braids with her long hair and finish them off with some lovely fishtails. 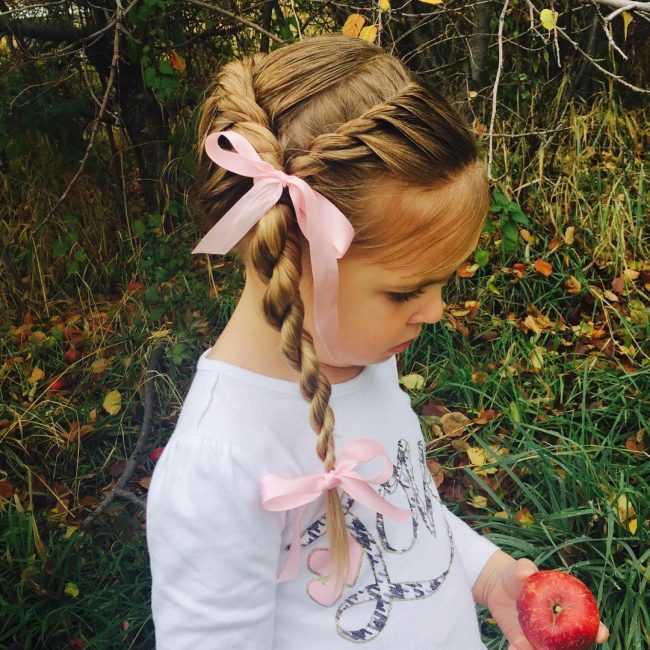 Few little girls if at all any would say no to a pink ribbon because it looks amazing on their hair. 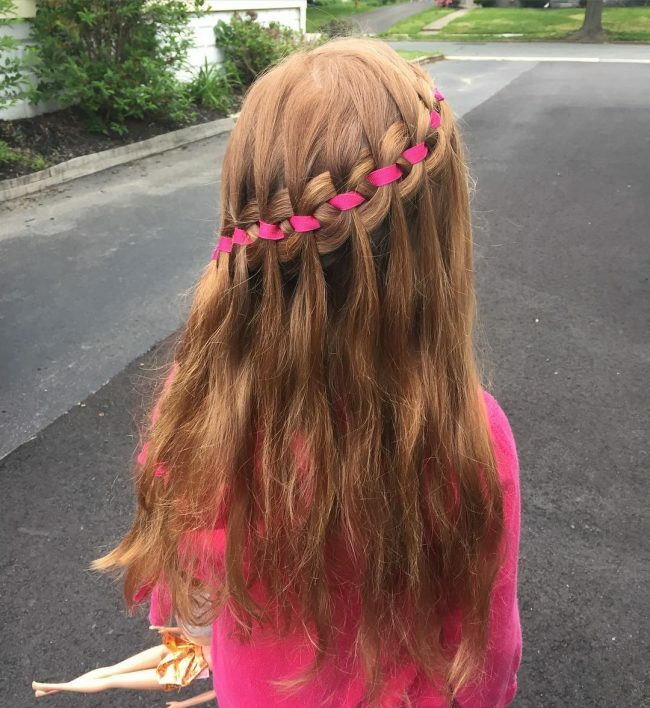 The pink ribbon on this hairdo is part of the fancy four strand waterfall braid that flows diagonally from one side to the other to create an eye-catching look. These strands also have an amazing color and some cute waves that also help to spice up the look. 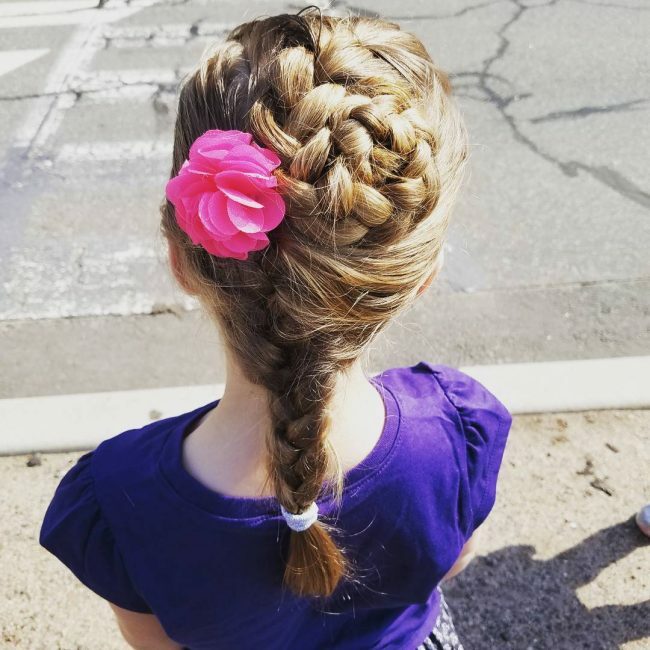 This hairstyle is another perfect example of a braided updo for a little girl who does not like hairs flowing over her face. It entails spinning a long ponytail braid and then wrapping it around the head. You should also use some pins to hold it in place, and you can finish the look by accessorizing with a flower. 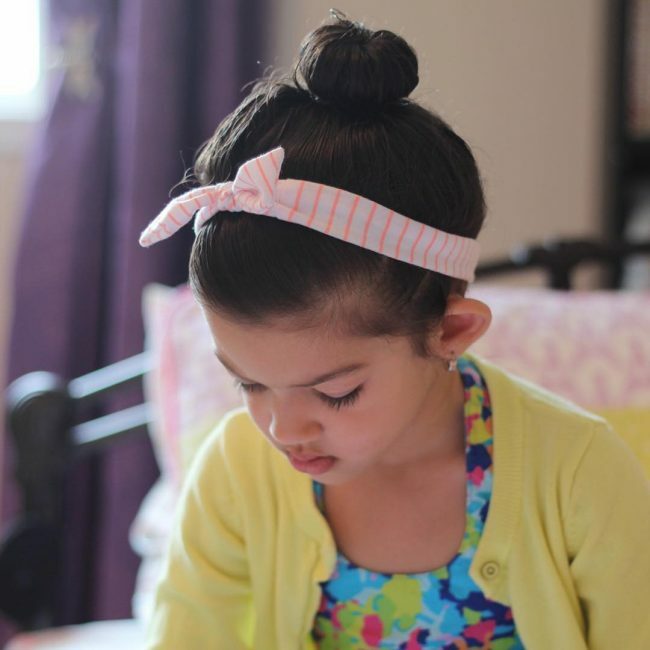 A bun like this one may look complicated, but you can still create it with a little effort. 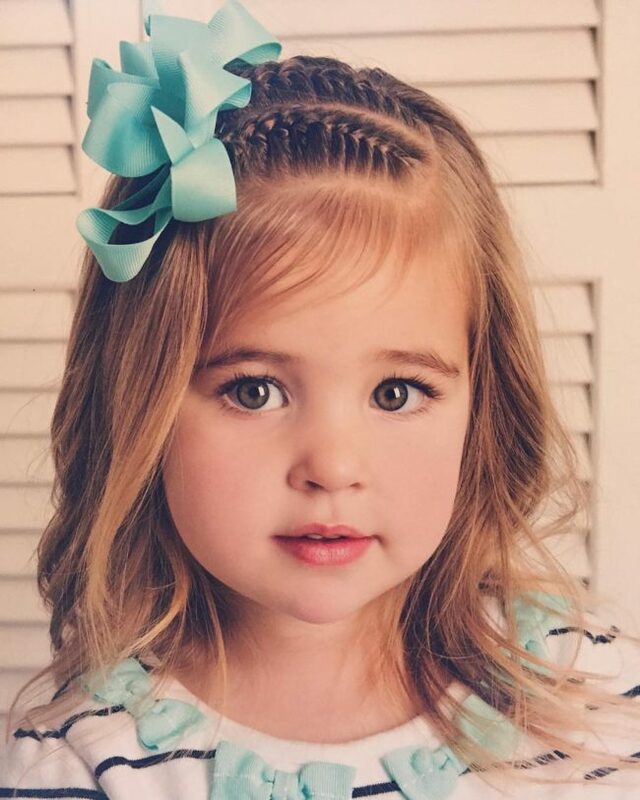 However, for your little girl to look this charming she should have voluminous and extra-long strands. 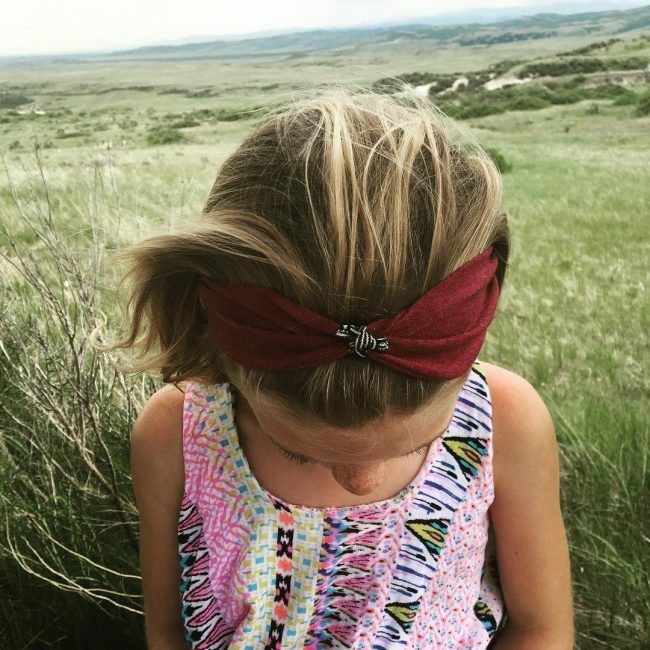 The bun is quite neat, and it has an intricate braid that wraps around and a gorgeous sequence bow that adds to the cuteness of the headdress. 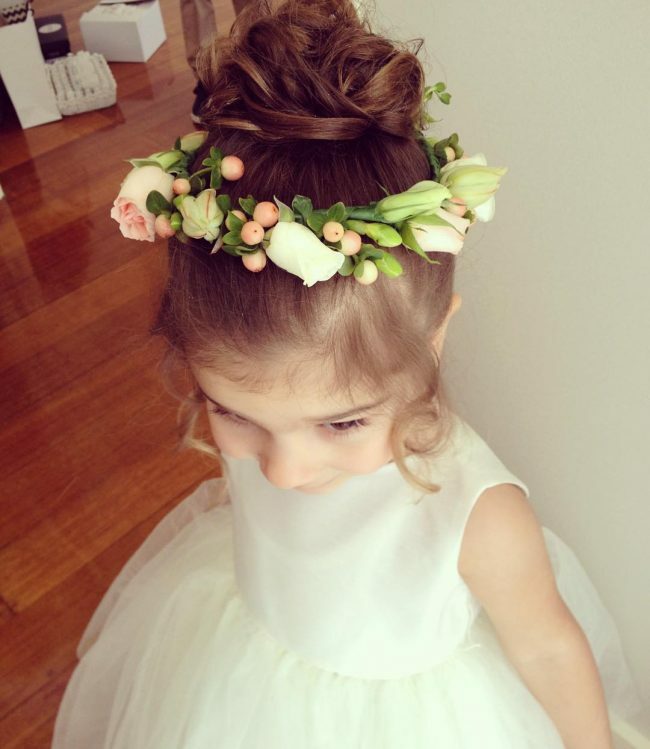 Something as simple as a flower crown can give your little girl that perfect hairdo that she always desires. And the good thing about this is that you will not have to inconvenience her with many hours of weaving her strands. If she also has long hair with soft curls like this one, then you can be confident that she will look magnificent. 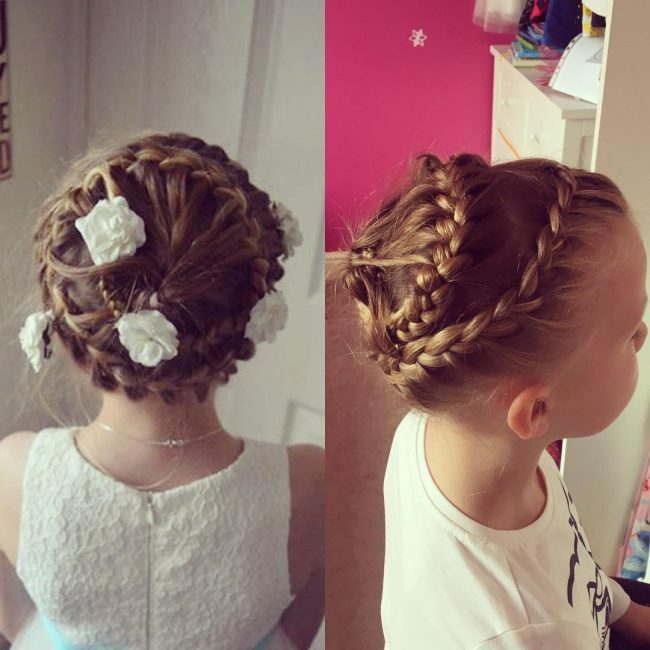 Little girl hairstyles can be as simple or as complicated as you wish, and it all depends on what you like and also what she prefers. 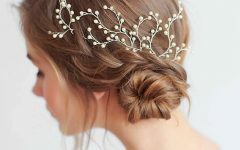 However, there is always something lovely to try out, and you only need to figure out what your girl likes, and the different styles above will give you some ideas on the different hairdo that you can use to make her feel like a princess.